I've been backpacking regularly in the Rockies since 1986. I do at least one weeklong trip every summer, and often take three-day trips. I'm usually camping in alpine terrain, at altitudes 5000 to 10000 ft (1500-3000 m). I prefer base camp backpacking, a long hike in with day trips from camp. Recently I've been actively reducing my pack weight, but still sleep in a floored tent and often include my favorite camp conveniences. 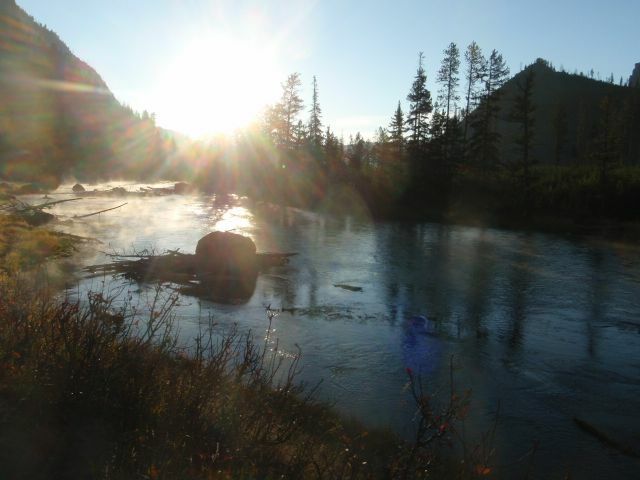 Summer and autumn backcountry trips are often organized around fly-fishing opportunities. 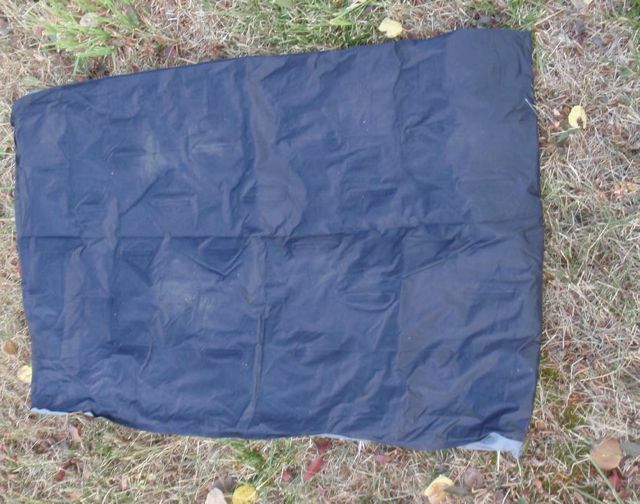 The Q-Core is an extra thick inflatable but non-self-inflating sleeping pad that features insulation with a synthetic fabric called X-Static� and rated by its manufacturer to a temperature of 15 F (-10 C). Below that temperature Big Agnes recommends supplementing the Q-Core with a closed cell foam pad. Big Agnes modestly describes its Q-Core line as "the most comfortable pads on the planet." The Q-Core is available in two widths - 20 inches (51 cm) in lengths of 66, 72, and 78 inches (168, 183, and 198 cm), with MSRPs of $119.95, $139.95, and $149.95 US respectively; and 25 inches (64 cm) in the 78-inch (198 cm) length, MSRP $179.95 US. I shall be testing the intermediate length 20-inch (31 cm) pad. The featured insulation is a civilian application of a product, X-Static, developed by Noble Biomaterials, Inc., for the military. A hangtag that accompanied my Q-Core includes a schematic drawing that illustrates how the X-Static works. An outer layer of 90% polyester fiberfill and 10% X-Static is bound to a thicker inner layer of all fiberfill. Through use of strands of the noble metal silver the fabric traps and reflects body heat. The silver also enhances the fabric's antimicrobial properties, helps eliminate odors, and (true to its brand name) dissipates static electricity charges. When I saw a demonstration by X-Static's maker this last attribute was claimed to reduce fatigue. Only the silver topside of the Q-Core hints at all these wonders, which I look forward to testing in the backcountry. The most apparent feature of the Q-Core is its thickness - to my eye noticeably thicker than any other pad I own, including two down-filled pads from another manufacturer. Also eye-catching at first glance is the pad's alternating pattern of air chambers, called "alternating I-Beam construction" by Big Agnes. 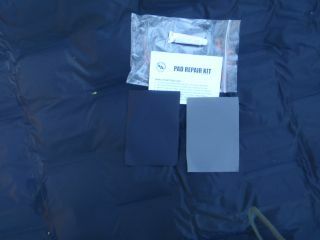 Top (silver-colored) and bottom (black) are rip-stop nylon. I inflated the Q-Core by blowing it up through a single insulation valve located in the corner with the product's name and Big Agnes logo, a straightforward process that took a couple of minutes. The I-Beam pattern doesn't seem to affect inflation, as the pad inflated relatively uniformly, just like any other pad inflated by mouth that I've used. The valve closes by twisting it clockwise. To the right is a photo (quilt underneath to show the straps) of the Q-Core held in place by the straps of my sleeping quilt, a modified Nunatak Ghost (separately reviewed on this site). Looks like a tight fit at the footbox. To the left is a similar shot (also with quilt underneath) with my other quilt, a Nunatak Back Country Blanket (again, reviewed on this site). The Blanket has no straps but is long enough that I can cinch it up with its Velcro below the bottom of the pad. These are my regular three-season quilts, and the ones I'll be using during this test. Deflating the bag is similar to other inflatable pads. I opened the valve, squeezed air out from the end opposite the valve to the valve end, folded the deflated pad lengthwise, folded it across, and then rolled it up, pushing out the remaining air as I did so. Synthetic insulation, which means (unlike my down pads) no prohibition on blowing up the pad by mouth. Thickness. I'm hoping this will increase both comfort and insulation. The outside pocket on the stuff sack. This seemingly insignificant detail makes it infinitely easier to insert and withdraw the deflated pad. Including the repair kit and designing a chamber for its storage. A very nice touch. Haven't found anything not to like. I packed the Q-Core for a seven-day, six-night (first week of July) backcountry service trip along the beautiful South Fork of the Flathead River in the Bob Marshall Wilderness Area in northwestern Montana. Elevation here ranged from 5000-6500 feet (1500-2000 m); at our base campsite near the Black Bear Forest Service Cabin the map indicates an elevation of 5833 feet (1778 m). Except for one early morning thunderstorm followed by off-and-on rain showers and overcast skies, all weather was clear, with daytime highs to 85 F (29 C) and nighttime/early morning lows of 35-45 F (2-8 C). 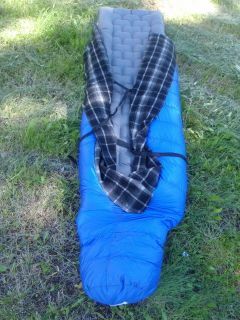 I used the Q-Core with my Nunatak Back Country Blanket, solo in my Bibler Ahwahnee tent. (As with the BCB, I have posted an Owner Review of this tent on this site.) Each night I slept in my customary backcountry pajamas - long-sleeve hoodie and long johns, each made of lightweight merino wool. On the two coldest nights I added a down shirt and wore heavy wool socks. My next trip was a four-day, three-night backpack along Slough Creek in Yellowstone National Park, Wyoming, in mid-August. Elevation at our campsite was about 6300 feet (1900 m). Nighttime temperatures were just above freezing, with frost on the ground. I used the same sleep system as in the Bob Marshall, except that I wore a down vest instead of a down shirt. Again I slept in my Bibler Ahwahnee tent. We had no precipitation on this trip. On the Bob Marshall trip I awoke after my first night in camp - the Q-Core's first night in the field - to find that the Q-Core, which I had inflated to slightly less than capacity (my custom with any inflatable pad), had lost air during the night, to the point where it was only about one-quarter full of air. Fighting off panic, I re-inflated the pad to capacity and headed off to work. When I returned that evening the pad was still fully inflated, as it was the next morning after a second night of the pressure of my 200 pounds (91 kg). After releasing a small bit of air to return to my usual just-under-capacity level and turning the valve carefully to secure it in the closed position I didn't have to touch the valve again until we broke camp Friday morning. Based upon overall performance I attribute the first night's deflation to my own carelessness in not tightening the valve completely after inflation. My first day at Slough Creek confirmed this diagnosis. I had inflated the pad to my usual standard, then headed off to fish. When I was ready to retire for the night the pad had lost air, so I re-inflated it. Again the Q-Core retained all air through the night, as it did for the remainder of the trip. Maybe the valve is sticky, but more likely I simply didn't turn it all the way closed. Using the Q-Core has required some adjustment to my sleep system. Especially since converting to quilt use in the three warmer seasons I have relied almost exclusively on three-quarters or shorter length pads. As noted in my Initial Report I am testing a full-length Q-Core. During the first couple of nights I carefully inserted the Q-Core into the closed end of my BCB. Though I am six inches (15 cm) taller than the length of the Q Core all of me except my head had the insulated pad underneath. The length alone added considerable warmth; even on the coldest night I didn't need to close the BCB past my waist. When the temperature exceeded 40 F (4 C) I dispensed with inserting the pad into the foot of the BCB, using the BCB strictly as a top quilt. When using a shorter pad the break point for similar use has been about ten Fahrenheit degrees (six Centigrade degrees) higher. Part of this differential I attribute to the Q-Core's insulation, not just extra (for me) pad length. Underneath me the pad feels warm, comparable to the feeling I get from the various down-insulated pads I've used. I won't venture to guess at the relative insulating abilities of X-Static versus down, but the former is definitely adequate - more than adequate - for the temperatures I have so far experienced. After abandoning the insertion-at-the foot method there was nothing to keep me centered on the Q-Core. That's normally a problem for me, as I am a very restless side-sleeper. But not once did I twist or turn off the Q-Core. On the second trip I used my BCB as a cocoon but didn't insert the Q-Core into the footbox, and again I stayed centered on the pad all night. As I can recall no other pad, including my down pads, about which I can make a similar statement, I'm prepared to credit the material on the outer topside of the Q-Core with some adhesive properties. X-Static does live up to its name, as I saw or heard no static electricity from direct contact with the pad or friction between the spinnaker cloth of the BCB and the pad's topside. That means there wasn't any, as I paid careful attention each night and morning and midnight bathroom breaks to detect static. What about reducing fatigue, as X-Static's maker has claimed? Obviously I can't measure this, but I will say that my Bob Marshall adventure was a particularly brutal service trip. At 11.5 miles (18.6 km) the hike in was longer than usual, and we had larger than usual packs loads because of a mix-up with the packers. Our work included hand sawing and crosscut work, often bushwhacking on steep side hills. Much of the work took place in a burn area with ample soot and no shade. I awoke each morning with fewer of the everyday aches, pains, and stiffness that normally accompany this kind of work. Whether the X-Static provided some pep or just because I got a good night's sleep, the Q-Core had something to do with it. And I'm very grateful indeed. My only minor criticism of the Q-Core has to do with deflation. Following my standard practice I opened the valve, pressed out as much air as I could, and began rolling up the pad, folding it twice vertically and twice horizontally. Perhaps due to the alternating I-beam construction I had a bubble of air or two at the end of the process, which made re-insertion into the stuff sack a challenge. On my next trip I rolled the pad up from foot to head (where the valve is) and then folded it over, reducing but not completely eliminating the problem. My Q-Core looks as good as new after nine nights' use in the woods. Each time before breaking camp I brushed off a few stray leaves and small debris that had found their way into my tent. 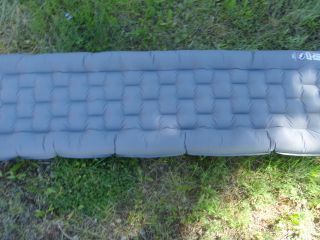 Unlike some other pads I've used the underside of the Q-Core does not appear to act as a magnet for such tent detritus. There wasn't much attached and what was there brushed off easily. So far the Q-Core has been a real winner in all performance categories. My next backpack was a four-day, three-night service trip on a brand new stretch of the Continental Divide Trail (CDT) in the Gallatin National Forest in Montana, just east of the Idaho border between the towns of West Yellowstone, Montana, and Island Park, Idaho. This section will soon be opened to the public as the Lion's Head Ridge Trail, after one of the summit face's prominent features. Our group completed the CDT's crossing of Watkins Creek near our campsite at about 8000 feet (2450 m). We had great hiking and working weather - about 70 F (21 C), with mostly clear skies and occasionally blustery winds most of the days and nighttime temperatures dropping to a low of 20 F (-7 C). On this trip I used a different quilt with the Q-Core. It is a hybrid of two list Nunatak Arc quilts, the Arc Alpinist and Arc Expedition. (Another member has reviewed these two quilts on this site.) Completing my sleep system were my Nunatak Skaha sweater and Golightly Cashmere watch cap, two items that I have reviewed here, and on this trip I slept in my Hilleberg Unna tent, the subject of another of my Owner Reviews. At the beginning of October I used the Q-Core on a two-night, two-day backpack in the northeast corner of Yellowstone National Park, a backpack-fishing combination. More of the same boring, marvelous backpacking weather - daytime highs about 75 F (24 C), nights down to 25 F (-4 C), no appreciable wind and utterly no precipitation. The morning temperatures in the Park were however well below the dew point and there was frost everywhere and lovely mist on the water. I used the same sleeping kit as the Gallatin hike. Most recent use in the testing period was an overnight car-camping trip along the West Boulder River near McLeod, Montana. 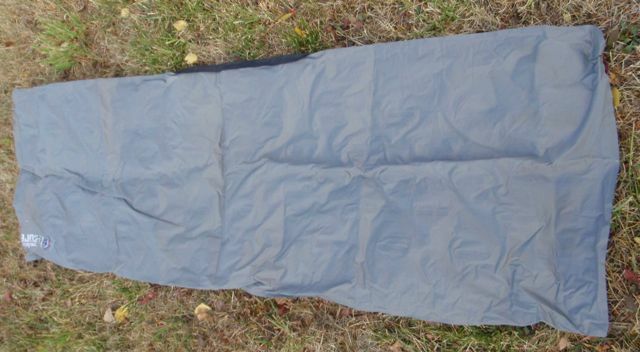 The other components of my sleep system, including clothing, were the same as the CDT trip, but this time a friend, her two children (8 and 12), and I used my Tarptent Hogback (see Test Report). Nighttime low recorded in McLeod was 15 F (-10 C) and the cold lingered through our morning in camp. I have little to add to the commentary in my Field Report, as my Q-Core has continued to perform well as an insulating sleeping pad. I noticed the insulating ability more with the colder temperatures, and in those conditions I really appreciated the Q-Core's 72-inch (183 cm) length. An insulated pad of any kind felt warmer on my legs than does my backpack, which usually keeps my feet off the ground. The length was perfect for my solo tent and, with my head on a stuff sack "pillow" just above the top of the pad, about equal to the rest of my body. The Q-Core compensated handsomely for my quilt's lack of down on the underside. The temperatures on my last three trips approached Big Agnes's stated limit for use of the Q-Core without a supplemental pad. Based upon my experience I'd say the manufacturer is overly modest. I'm a very cold sleeper but I wasn't even slightly chilly on the underside, and I was using a quilt with an open area on the bottom. Well done, X-Static! As on the trips described in my Field Report I did not wrap the quilt's straps around the pad, and I still did not slide off the quilt. I now attribute this to the alternating I-Beam construction, which has slightly raised chambers on each side. But, fabric or construction, this is a great feature of the Q-Core. I made some headway on improving deflation by (1) ensuring that I forced most of the air out before folding, (2) then making a vertical fold, (3) then a horizontal fold, and (4) rolling up from there. I still had a bit of air inside the pad at the end, but because the valve was now at the top left corner I could get the last of the air out sufficiently to allow me to compress the now-deflated pad into its stuff sack. I found the process still to be a bit frustrating, but for the reasons stated in the following two paragraphs I'm willing to suffer through it to avoid one obvious alternative, a second valve. Somewhat to my surprise, as I thought since my first night on the Q-Core I'd been conscientious about tightening the valve after inflation, on the Gallatin trip I had another incident of an unintended underinflated pad. Returning to my tent after the first day's trail work I found the Q-Core with far less air than had been inside in the morning. Sure enough, the valve was slightly ajar. As I had not had a problem during the night, perhaps the opening was caused by my accidentally brushing against it while dressing. A careful sharp turn after re-inflating to the desired degree and all was well for the remainder of the trip. The problem did not recur on the later trips. The best evidence that it takes a direct hit to cause a leak was the car camping trip, when two rambunctious kids inside the tent had no impact on the inflation level. If frequent pressure on the pad or moving it around would reduce inflation, it would have been flat in ten minutes. I have considerable experience with two-valve inflatable pads; a second valve is necessary on a down-filled pad to permit air circulation necessary to remove moisture that has invaded the chamber when a user blows up the pad by mouth instead of following instructions and using an external means of inflation. The problem of a leaking valve should by rights and logic be double with two valves, but in my experience it's far worse than that. Maybe valves can work loose from inadvertent contact, particularly in the crowded confines of a small shelter with occupants who can't avoid some scraping or brushing the valves. Maybe I'm just lazy or not thorough enough when tightening sleeping pad valves. Whatever the reason I vote to reduce the chance of awakening on a flat pad on a freezing night by sticking to one valve if possible. I've still not had to clean the pad, and it still looks like new after fifteen field nights. The fabric didn't pick up dirt or brush on any trips, a genuine accomplishment on the last two backpacking trips in the dusty, dead grass-filled fields in which I camped in the parched Northern Rockies. Again the kids offered a special challenge, as the tent floor was strewn with potato chip crumbs, but the Q-Core emerged unscathed. While I thought I might have to use the repair kit on my first night out (see my Field Report) thankfully that hasn't necessary during the four-month test period. It remains in its pocket in the Q-Core's stuff sack. In the Big Agnes Q-Core I think I've found the perfect complement to my sleeping quilts, at least for three-season camping (with autumn extending through until real snowfall). It's warm, it keeps me atop it, and unlike a down-insulated pad I can inflate it quickly by mouth. (For those of you who haven't had the experience of inflating a down pad on a rainy day or freezing night, I cannot begin to describe the benefits of this last attribute.) I'm looking forward to many more camping nights sleeping comfortably on my Q-Core, and I intend to push it a bit to see if it will work as well at even lower temperatures. Keeps me warm. 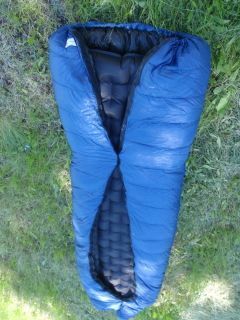 An ideal mate for a sleeping bag or quilt with no insulation on the bottom. Keeps me on top of the pad. Easy to use, especially compared to a down-filled pad. In hindsight I might have preferred the longer (78 in/198 cm) Q-Core, and since the smaller width doesn't fit in the footbox of any of my quilts anyway I wouldn't lose any functionality if I went wider. More of a good thing is usually a good thing. Of course this isn't any criticism of the product. My only suggestion for improvement would be a moderately larger stuff sack. The one I have works well with a factory-folded pad but takes some effort with my hand folding even when I can squeeze all the air out. This concludes my Test Report, which has been a pleasure. Many thanks to Big Agnes and BackpackGearTest.org for this opportunity.